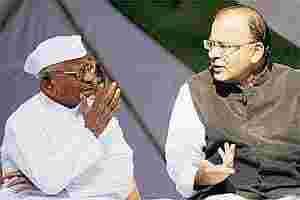 New Delhi: Sharing Anna Hazare’s platform, Opposition parties on Sunday backed his demands for inclusion of Prime Minister and lower bureaucracy under the ambit of Lokpal but some counselled Team Anna to be flexible and not expect every point raised by it to be accepted. While almost all the speakers were on the same page on most of issues raised by Hazare, CPI general secretary A B Bardhan warned Team Anna against branding as “corrupt" those people who disagree with its views and asked the activists to “listen to others". Leaders of BJP, CPI(M), CPI, JD(U), Akali Dal, TDP and BJD participated in the public debate on Lokpal Bill at Jantar Mantar where Hazare was sitting on a one-day dharna protesting against Parliamentary Standing Committee report on Lokpal Bill. No representative of Congress was present. Bardhan, however, said, “Team Anna should not expect that each and every point it makes is accepted. They should show some flexibility." “They should not think that the entire wisdom of the world is with 9-10 people. There is no dearth of scholars in a country of 120 crore. Team Anna should also listen to others and have patience to listen to others," he said. Samajwadi Party’s Ramgopal Yadav also echoed similar views, alleging he has come across people who wave the tricolour from Hazare’s platform and indulge in corrupt practices in UP’s Etawah. Accusing the Parliamentary Standing Committee of not honouring Parliament’s resolution on Lokpal, senior BJP leader Arun Jaitley said there were no two opinions about having a strong Lokpal bill. “We demand everybody who is in the government should come under the purview of Lokpal. We oppose the Prime Minister’s non-inclusion in the Lokpal bill," he said. “We are of the view that the Lokpal should have a search committee of its own and people with impeccable integrity should be its members and they should select. It is very important to take the CBI out of the government’s hands. It is being misused by the Government. The CBI director should not come under the government," he said. “The very basic principles of having a strong Lokpal should not be tampered with. Including lower bureaucracy and citizens’ charter in Lokpal was the sense of the house. We can differ on mechanism but not on the basic principle," he said. “It is breaking the promise you had given to the nation, to Parliament," he said. Bardhan said it was unfair to keep the Prime Minister out of the Lokpal ambit. “The Prime Minister is also a minister of many ministries and he is responsible for taking decisions. If the Prime Minister is not brought under the Lokpal, then who will take care of the corruption in the ministries. The investigation has to be done," he said. Alleging that CBI is being misused by the government which if it “wants to wean away a chief minister, uses CBI", he said, “This cannot keep on happening and anti- corruption wing of the CBI brought should be made answerable to Lokpal." “Corruption in judiciary is a very sad state of affairs and we are of the opinion that judiciary should not be brought under Lokpal. The Constitution has given a special place for judiciary and that should not be disturbed. We demand that a Judical Accountability Bill has to be brought and passed," he said. CPI(M) politburo member Brinda Karat wanted big corporate houses to be brought under Lokpal. “They (private companies) will have to brought under Lokpal. They are looting the country like anything and they will be under the body," she said. “Many of my colleagues here may disagree with me but we are of the opinion that MPs should also be under Lokpal," she said. “Why Group-C employees are not brought under Lokpal. We want to know. Parties keep talking about national security being affected if the Prime Minister is brought under Lokpal. There are a lot of defence deals where corruption has taken place," she said. Strongly backing Anna, JD(U) chief Sharad Yadav said his party will ensure that “not a comma or a full stop will be changed" of the ‘Sense of the House´ summed up by finance minister Pranab Mukherjee in August after the debate on Lokpal in Parliament. Terming “political use" of CBI as “very dangerous", he pitched for an autonomous and independent CBI. He pressed for extending the Winter Session of Parliament or call a special session to pass Lokpal Bill.